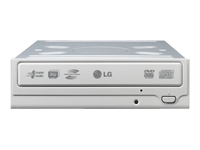 LG GSA-4166B internal DVD writer / burner is a Super Multi DVD-writer that can reads and writes to DVD-RAM media as well as typical CD-R, CD-RW, DVD+ and DVD- discs (both R and RW), including Dual Layer support. GSA-4166B also has LightScribe support where special LightScribe compatible discs can be flipped over in the drive to burn an image onto the surface of the disc for disc labeling. CD Freaks reviewed LG GSA-4166B and concluded that “the LG GSA-4166B makes an excellent choice if you are looking for a drive that supports all available DVD/RAM/CD media available at this time. The drive is a very good reader and an excellent writer and with removal of read speed locks on some media types, support for bitsetting on +RW media and disc error scanning this would truly be a well rounded drive. With all things considered, we can highly recommend the LG GSA-4166B for your next Super Multi drive.” CD Freaks even awarded the GSA-4166B Super Multi-DVD Writer the “Safe Buy Award”.